This special episode features commentary and observations from host Dave Young, based on his experience as a judge at the Northwest Regional Qualifying Round of the 2009 Games, held May 16, 2009 in Seattle, WA. 00:00 - 27:00 Dave explained how he did his job as a judge. 27:00 - 39:30 Dave wondered if the integrity of the judging could be open to dispute. He wondered why there should ever be compromises on integrity. Dave closed by suggesting improvements to the judging process. 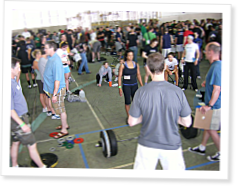 Editor’s note: Each regional qualifier was run completely by the regional director, who in this case was Dave Werner from CrossFit Seattle. All choices about venue, programming, judging, and scoring were his. Dave, I've been thinking about many of the same issues regarding improvements to judging, thanks for talking about this. As the Crossfit Games evolves and grows larger I hope to see specific training for judges, not just a brief meeting before an event to go over points of performance. Best of luck to Nicole Verbrugghe and your whole team over there at Gravity Janes Crossfit! Dave, good stuff. I think since most Regionals have judges pooled together from CF boxes that can be great distances away. Formal judge training is difficult. Until the CF Games spends resources ($$) on the judges and they become more than volunteers, there will be a great disparity between objectivity and proficiency of the judges present. You know what might be beneficial (but would cost $$) would be to develop some sort of online seminar/training course. I know most people who sit in some sort of office have sat through Computer Based Training before. A resource like that may go a long way to helping all judges get on the same page with doctrine, maybe even get an organized verbage for how to inform an athlete of a foul or missed rep. There's tons of video/pictures to pull from already in the exercises section on the mainpage and with the many vids CF'ers are posting all over the internet on a daily basis. That could be formalized and required completion necessary to be a judge at regionals or the international games. I think that would also build a judges' confidence so that they have the guts to call out a fire-breather. Then you can keep the meetings that take place before the events to specifically going over the movements for that event. That'd be a large task, but again until resources are applied to judging, the issue will remain unchanged. Oh Dave, I agree too about the judge/cheerleading. The judge has to remain stoic and shouldn't be involved emotionally (unless we want the games to remain at the level they are at now, which honestly I wouldn't be that upset with for selfish reasons). But if this is to be big, talking T.V., DVD reproductions, etc. We have to have judges detaching themselves and concentrating on judging. I thought the judging at the SoCal regionals was fantastic, but I too saw judges get caught up in the moment, and even though I didn't fault a volunteer judge for that, thinking back on it, I do remember thinking, "Oh, they must know that guy/gal" And it didn't bother me then, but now that you mentioned it, I think that too is something the training should cover, the demeanor of a judge and your conduct while on the premises in that role during an event. I have to say, I disagree with what he said about judging. I watched every round of the NW qualifier and saw some competitors ready to throw punches at the judges for DQing reps, especially with the SDHPs. It was a very tough WOD and to watch the faces of the competitors as judges DQ reps was heartbreaking. Also, many many competitors did way more than 150 wall balls. I watched from all sides, so saw a number of judges. i do agree that assigning the judges is a great idea, as well as a training session prior to the event if possible.